County Louth Coach Outing - 10th March 2019. Some of the South Dublin members that were on the Louth coach outing. Picture by Bill Rea. 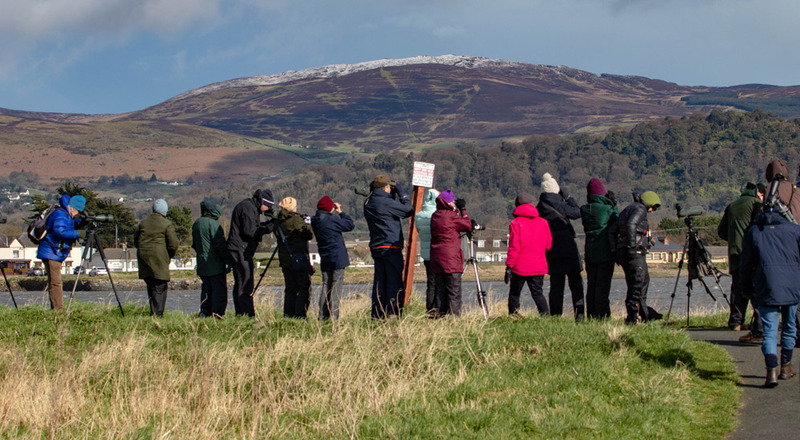 Our March outing is an ideal opportunity to have a last look at the visiting winter birds before they head off to their breeding grounds, and the coach trip to Dundalk Bay is always eagerly anticipated. 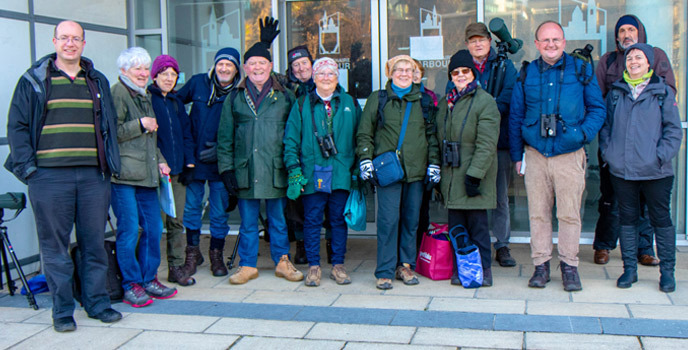 We departed a little later than planned, due to a rare and unfortunate error by the coach company, but we made good time up to Co. Louth and on route we saw a Little Egret at Booterstown Marsh, and a Buzzard along the motorway, our first birds having been Goldfinches at Dun Laoghaire. 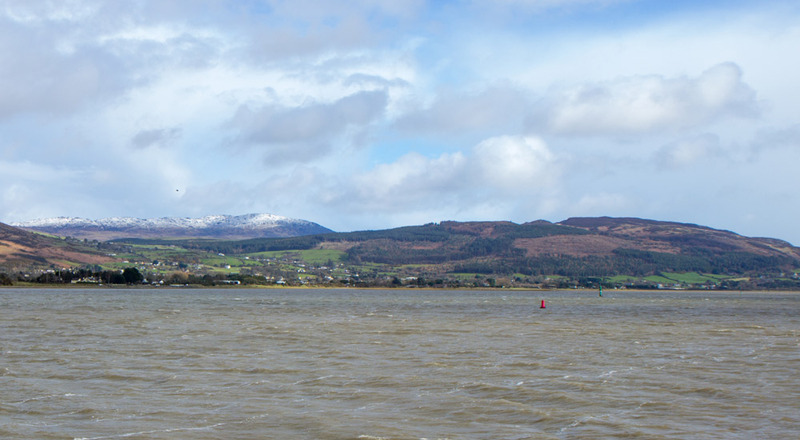 After a brief comfort stop we duly arrived at Dundalk Docks where there was a reality check regarding the cold day and the windchill factor as we fumbled about with tripod legs and tried to focus our telescopes and binoculars. But we were soon concentrating on scanning the estuary and marshlands opposite the quay. 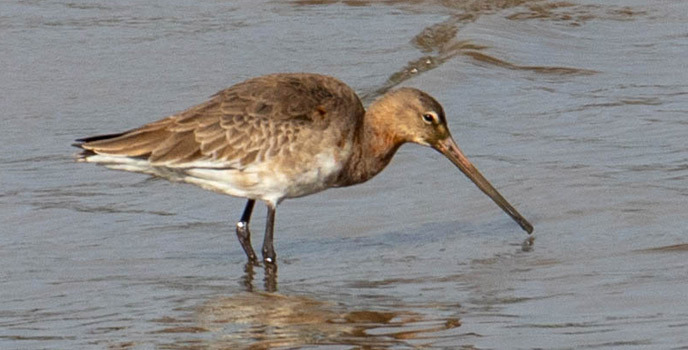 Black-tailed Godwit in the Castletown River at Dundalk Docks. Picture by Bill Rea. 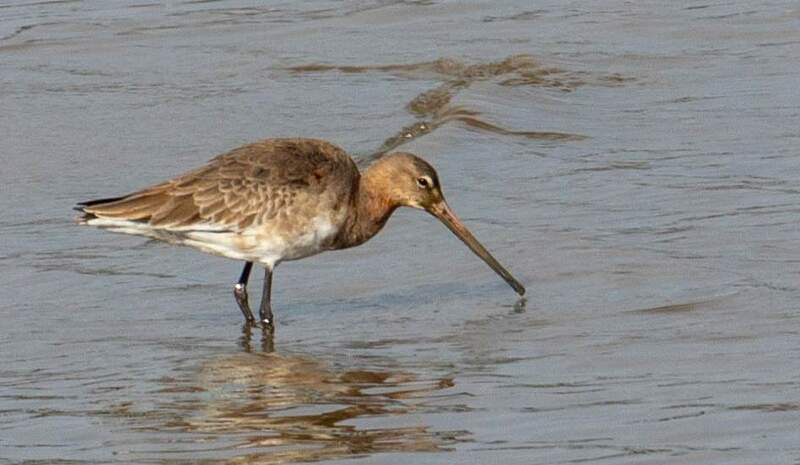 A Ruff was found by our leader Niall Hatch, and there were good numbers of Teal, the males looking splendid in their fine breeding plumage, and Redshank, Black-tailed Godwit and Brent Geese. A Curlew popped up it’s head briefly from the marsh and a Lapwing stood on the opposite bank. A few Greenshank, Dunlin and Oystercatchers were also seen. Some people went round the corner where it was less windy and were rewarded with views of Grey Plover and a Mistle Thrush. Earlier in the week a Spotted Redshank had been seen feeding here and we have seen them in other years but sadly this handsome bird didn’t show up for us this year. 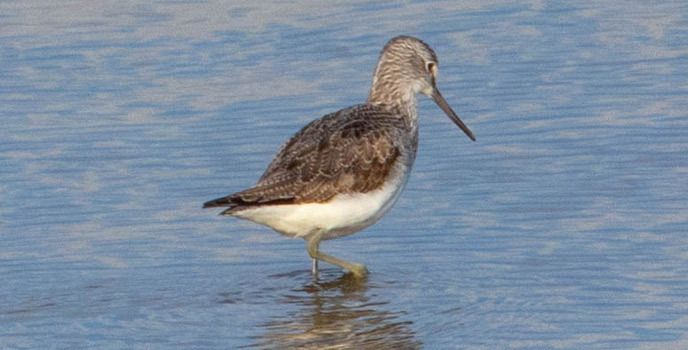 It is a long-legged wader, dark grey above and white below with a dark line through the eye and a slightly down-tilted bill, always a nice bird to see and not too common here in Ireland. There were a couple of Red-breasted Mergansers and later they stood on the bank busily preening and showing their beautiful colours in the sunshine. 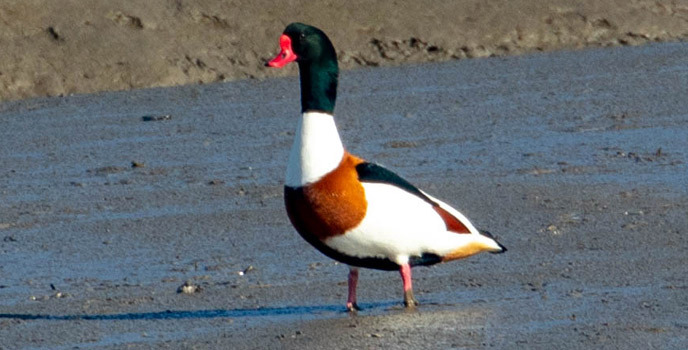 The colours of the Shelduck were also very striking in the bright light. This dockland really is a good site and on a rising tide the mudflats provide a full larder for a great variety of wildfowl. 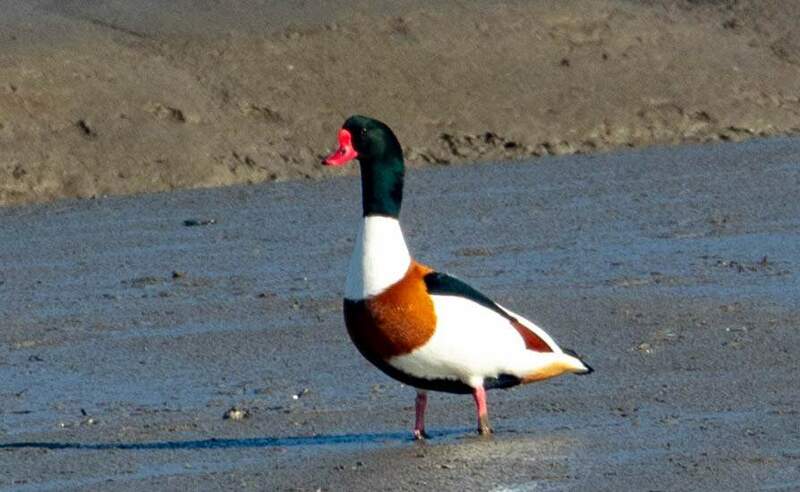 A male Shelduck at Dundalk Docks. Picture by Bill Rea. Suddenly a very black sky was sweeping over us so we scuttled back onto the coach to go the short distance to Soldier’s Point which is rather exposed, and so due to the very strong wind the song-birds were very scarce. No Stonechats, Linnets or Skylarks but a Rock Pipit was seen briefly. On the mudflats there were Dunlin , more Teal and a solitary Grey Plover standing on a submerged pole - an unusual sight. 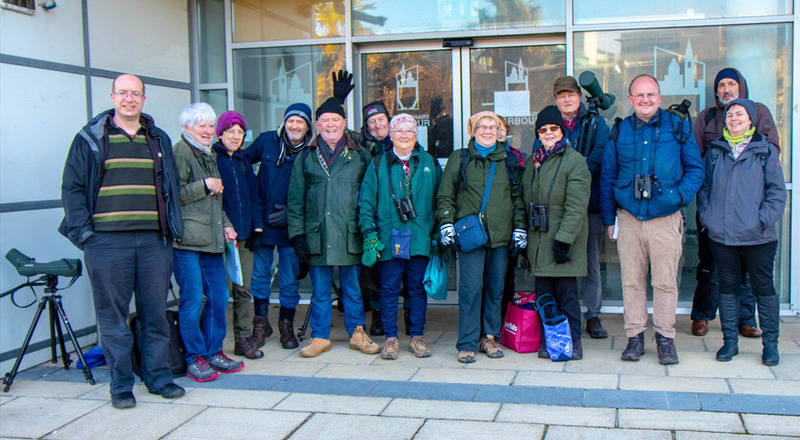 We then travelled on to Giles’ Quay, a welcome loo-stop, and ate our lunch in the warmth of the coach whilst Pat Twomey was busy with his scope using the coach as a hide as well as a cafe and calling out birds as he saw them. Good policy! 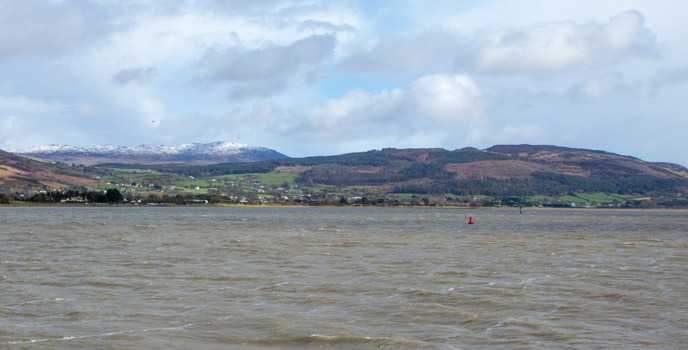 Looking across Dundalk Bay from Soldier's Point to the Cooley Peninsula with snow-capped mountain in the distance. Picture by Bill Rea. Sandwiches eaten we faced the elements again and found 12 Turnstones on the beach busily seeking insects under the seaweed, but no Purple Sandpipers with them today, and as they are often to be found feeding amongst groups of Turnstones it’s always worth checking through the flock. Out to sea there were good views of Red-throated Divers bobbing up and down on the rough sea, quite recognizable by the way the head and bill are held tilting upwards. 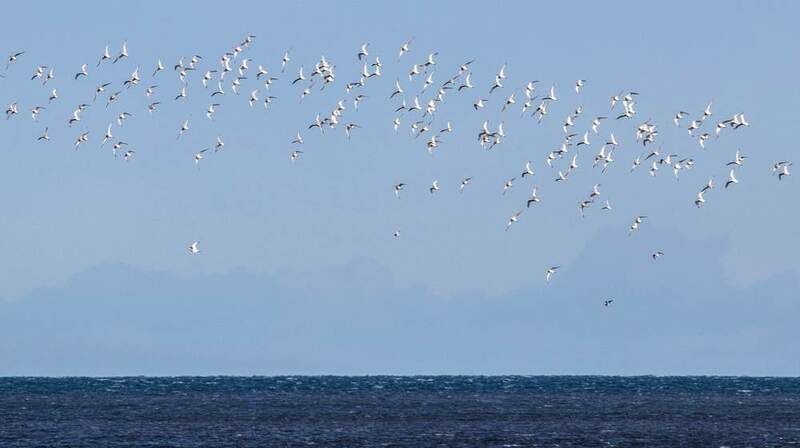 Cormorants were seen, and further out near the horizon several Gannets were flying about, large gleaming white shapes in the sunlight with long tapered black-tipped wings. Then we found a large raft of Common Scoters, large black marine ducks which are always a good find. Great Northern Divers and Great Crested Grebe were added to the list. Regarding land birds, we saw a Blackbird, a Raven and a gathering of House Sparrows. This area is a Twite hot-spot most years but sadly not this year and there was such a strong wind that the idea of walking along the beach and then inland to search for them was a non-starter. Small birds keep nestled down in bushes and grassy tussocks during such windy weather, only dashing out for food briefly. 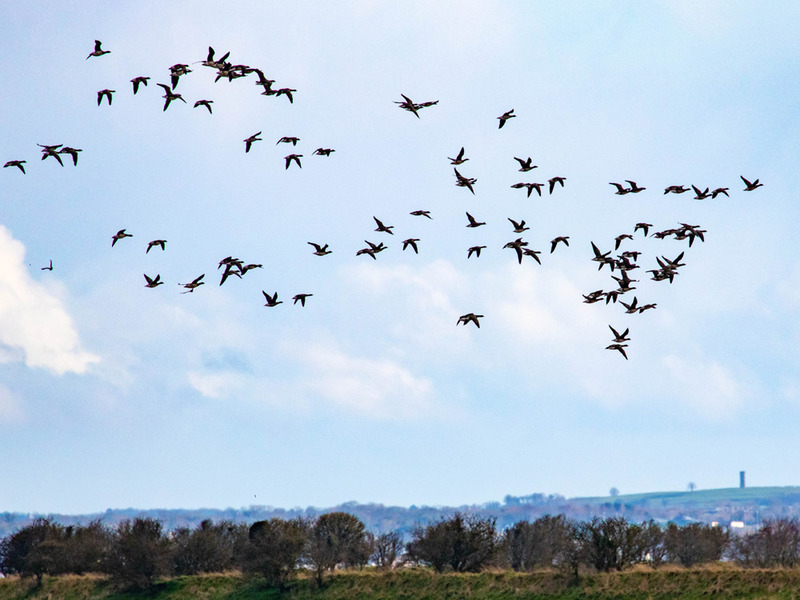 Brent Geese in flight over Lurgangreen. Picture by Bill Rea. And so we saved our energy for the last stop of the day and headed for Lurgangreen, which lies between Blackrock and Castlebellingham on the old N1. When you see a small bridge and a sign saying River Fane you can park off-road and walk down the lane which leads to the salt marshes and mudflats. On previous visits we have done well in the lane with sightings of Tree Sparrows but this year there were very few birds due to the high wind- and perhaps the marauding cat! At the end of the lane the vista opens out onto a wonderful expanse of open sea, mudflats and salt marsh and you can wander up and down here for a couple of hours identifying many species and listening to the geese and ducks. At the northern end of this expanse is the Oscar Merne bird hide which is a raised container thus giving a higher vantage point and close views of the birds at this end of the bay. If you intend to use the hide you will need to call in to “Joe’s” shop about a mile north on the N1 just before Blackrock. Joe is very kind to birders and keeps the key to the hide - you won’t get in without it! Access is free but the general policy is to purchase something from the shop when returning the key. 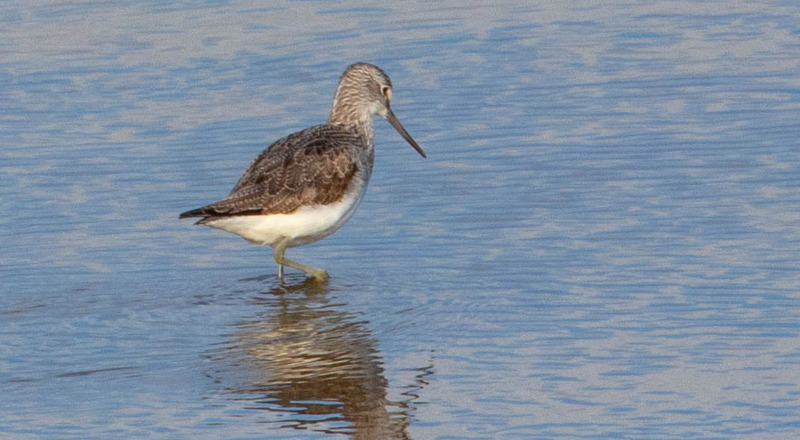 Greenshank on the prowl at Lurgangreen. Picture by Bill Rea. Lurgangreen is a major site for wildfowl with huge numbers of everything, a feast for the senses. As we approached the hide Niall spotted a Reed Bunting but unfortunately it didn’t re-appear. Luckily a couple of Yellowhammers were seen from the hide on a tree near the row of conifers, so it’s nice to know that this endangered bird is managing to hold on in this area. Greylag, Brent and Greenland White-fronted Geese were seen and Pink-footed Geese can be found here as well. Duck included Wigeon, Pintail, Teal and Shelduck along with wonderful displays by several pairs of Goldeneye. The 100s if not 1000s of Golden Plover whirling and turning showing a soft golden colour one minute and then the white of their under-sides when they all twist and turn direction was a spell-binding sight. No black belly-patches of summer plumage were noticed though. All the usual waders were present in large numbers. A Peregrine was found at the south end of the marshland, standing on the ground preening, perhaps after a feed. In the fields opposite to where we parked there are often geese and Whooper Swans, but sadly not present this year. 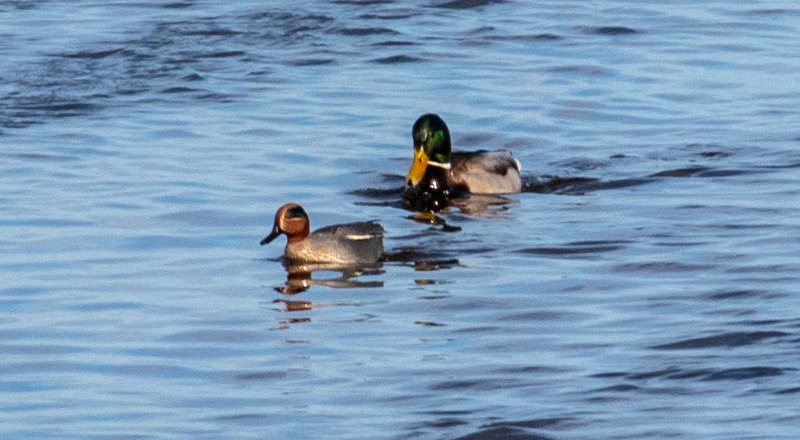 Male Mallard and Teal at Lurgangreen. Picture by Bill Rea. Some more pictures taken on the day by Bill Rea and Ronan Browne. 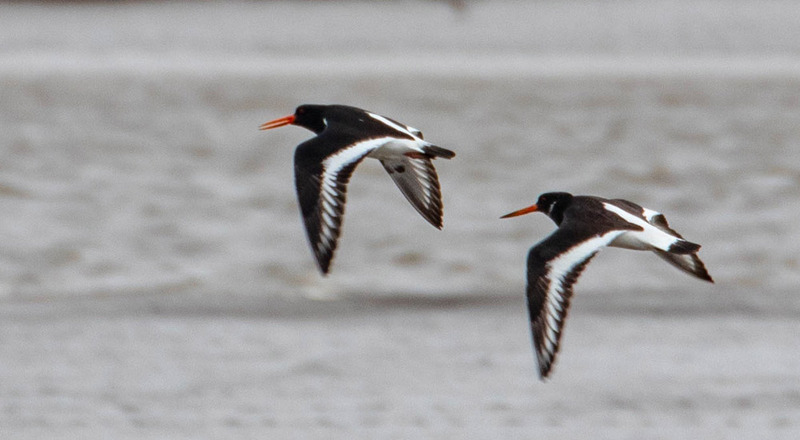 Oystercatchers at Dundalk Docks. Picture by Bill Rea. Golden Plover over Dundalk Bay. Picture by Bill Rea. South Dublin members and the bus at Giles’ Quay. Picture by Bill Rea. South Dublin members at Soldier's Point. Picture by Bill Rea. 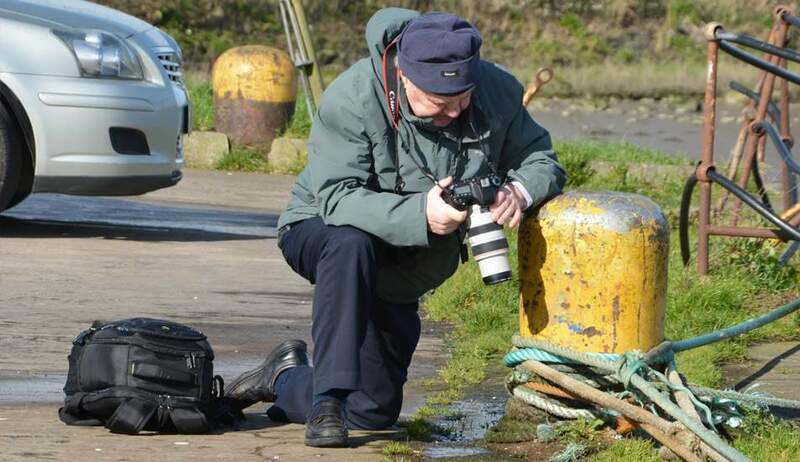 Our fantastic photographer Bill Rea, checking his equiptment. Picture by Ronan Browne. The beginning winds of Storm Gareth were against us on this year’s outing with no Whooper Swans, no unusual Grebes and no Glaucous Gulls or Iceland Gulls but we don’t mind that! 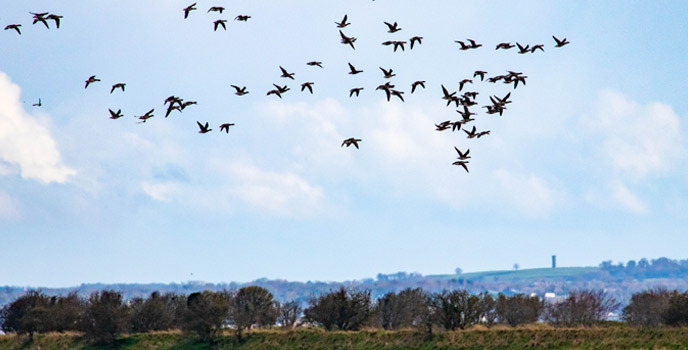 We had a great day and have the memories of the spellbinding spectacle of the thousands of wildfowl at Lurgangreen. Do visit there soon before they all leave us! 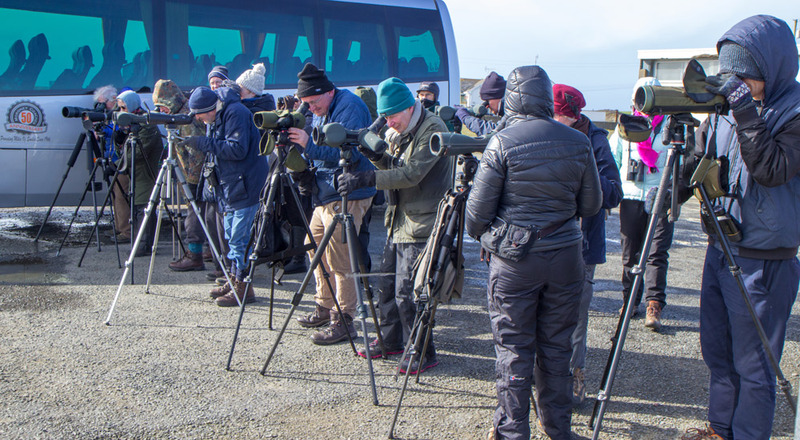 Many thanks are due to Niall who always ensures that everyone sees all the birds, to Eleanor for her great organizing skills and to all who shared their scopes to help others to see more clearly. It’s all appreciated very much.